Cell respiration is the process by which cells get their energy in the form of ATP. There are two types of cellular respiration, aerobic and anaerobic. Aerobic respiration is more efficient and can be utilized in the presence of oxygen, while anaerobic respiration does not require oxygen. Many organisms (or cells) will use aerobic respiration primarily, however, if there is a limited oxygen supply they can utilize anaerobic respiration for survival. Although there are some organisms (or cells) that always require anaerobic respiration and others that will always require aerobic respiration. Anaerobic respiration has fewer steps, so let’s start there. The first step in both anaerobic and aerobic respiration is called glycolysis. This is the process of taking one glucose (sugar) molecule and breaking it down into pyruvate and energy (2 ATP). We will discuss this in depth during aerobic respiration. The second step in anaerobic respiration is called fermentation. 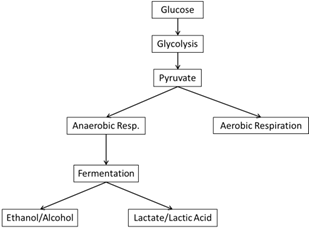 Fermentation starts with pyruvate (the end product of glycolysis). Depending on the organism, pyruvate can either be fermented into ethanol (a fancy name for alcohol) or lactate (lactic acid). Fermentation releases CO2, but does not make any ATP – all ATP during anaerobic respiration is produced during glycolysis. Since glycolysis produces 2 ATP, anaerobic respiration yields 2 ATP for every molecule of glucose. Both glycolysis and fermentation take place within the cytosol/cytoplasm of a cell. In fact, the entire process of anaerobic respiration takes place in the cytosol. Fermentation is the process by which we make wine and other types alcohol. Through an anaerobic process, yeast will break down the glucose in the grape juice and convert it into pyruvate. The pyruvate is then fermented into ethanol/alcohol. During anaerobic respiration CO2 is also released, this is why there are bubbles in wine and champagne (the release of CO2 during anaerobic respiration is also how yeast causes bread to rise). Of course, other organisms and bacteria can utilize this method of respiration as well, but yeast is the organism of choice for making wine. Other cells and organisms will ferment pyruvate into lactate, also known as lactic acid. I’m sure you’ve all been told that your muscles hurt during and after exercise because you have an excess build of lactic acid in your muscles. This is because of anaerobic respiration. During exercise, the oxygen supply to our muscle cells is limited. When oxygen is low, our muscle cells will utilize anaerobic respiration and ferment pyruvate into lactic acid. With rest and time, our body will eliminate the lactic acid and our muscles will no longer be sore. When we aren’t exercising, our muscle cells primarily use aerobic respiration because oxygen is plentiful. Now let’s talk about aerobic respiration. This is more efficient because it makes more energy (or ATP) for every molecule of glucose. However, aerobic respiration can only be utilized in the presence of an ample oxygen supply. In order to understand cellular respiration we first need to understand the basic chemical equation. Think about what you do when you’re tired and need more energy to stay awake. You yawn, which takes in a lot of oxygen, or O2, and you drink something with a lot of sugar, like Mountain Dew. A scientific term for sugar is glucose and the chemical formula for glucose is C6H12O6. We need O2 + C6H12O6 for energy to stay awake, just like we need O2 + C6H12O6 in order for cellular respiration to take place. Now let’s think about what happens to the oxygen we inhale after a big yawn. It goes to our lungs to get utilized and we breathe out carbon dioxide, or CO2. Mixed with the carbon dioxide are water droplets, or H2O. That’s why our breath fogs up the glass when we exhale onto the car window. In this equation, 6 is the magic number. There are 6 oxygen, 6 carbon dioxide, and 6 water molecules. There are also a couple sixes in our formula for glucose. Remember the number 6 when writing this equation. We will save the discussion of photosynthesis for a future lesson. If you understand everything up to this point, you are already 50% there. 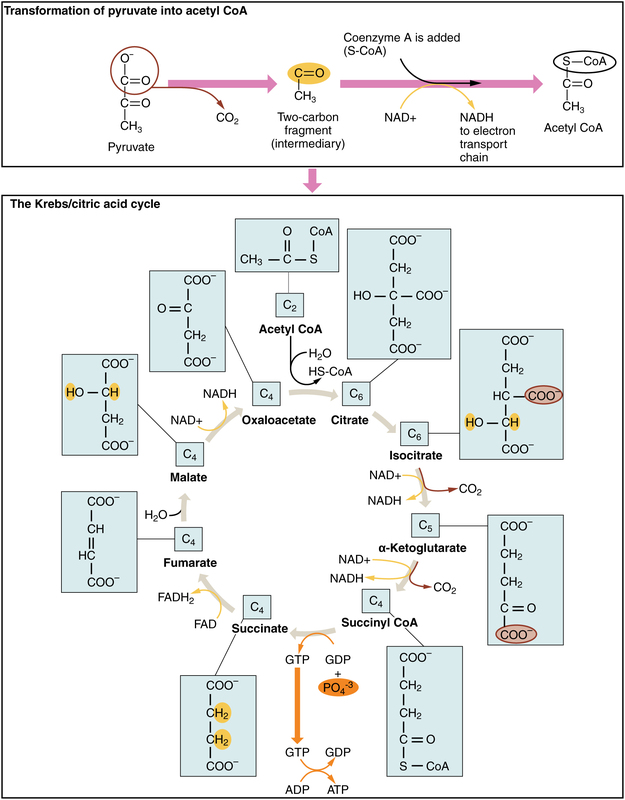 The first step in cellular respiration is glycolysis, or the breakdown of glucose. The naming of this process is actually very logical. Glycolysis literally means the breakdown of glucose. If we know that ‘glycose’ is an older term for ‘glucose’ and if we remember ‘lysis’ means to breakdown, then we can understand that glycolysis = glycose + lysis, or the breakdown of glucose. Glycolysis is the first step in cellular respiration for both anaerobic and aerobic processes. Glycolysis takes place in the cytosol of a cell. In the cytosol we convert 1 molecule of glucose into 2 molecules of pyruvate. Of course glucose can’t be converted into pyruvate without a little bit of help. This conversion requires 2 NAD+ and some energy, in the form of 2 ATP. Once glycolysis is completed, we are left with 2 pyruvate, 2 NADH, and 4 ATPs as products. Since glycolysis yields 4 ATP, but we had to use 2 ATP in the beginning of the process, the total Net Gain of energy is 2 ATP. The cell will use the 2 ATP for energy. NADH will be recycled back to NAD+ in a future process so that it can be used in glycolysis again. The 2 pyruvate molecules will be used for the second step of cellular respiration. The Krebs cycle, also known as the Citric Acid cycle or the TCA (tricarboxylic acid) cycle, regulates the oxidation of glucose. The Krebs Cycle! 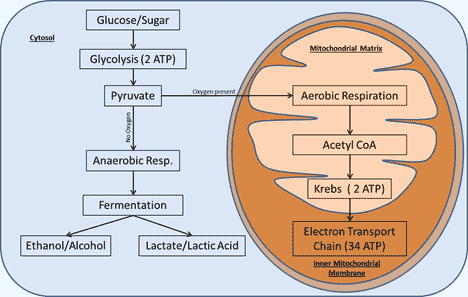 is the second step in aerobic respiration and takes place in the matrix of the mitochondria (middle of the mitochondria). 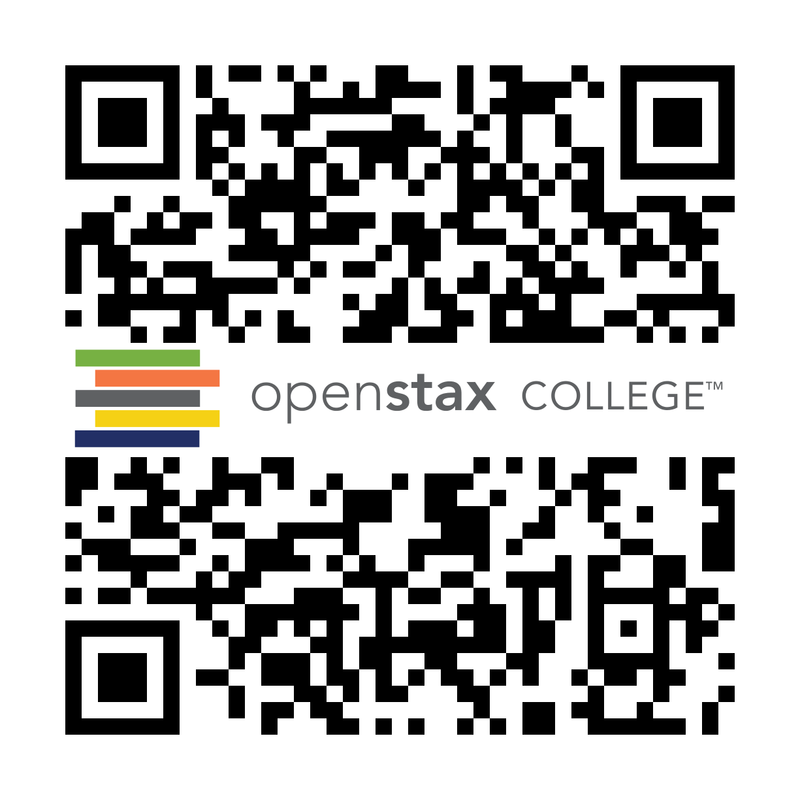 This is a multi-step process, but don’t worry, we don’t have to memorize all of the compounds or each enzyme involved. Here, we will only focus on the key players. We start with one of the two pyruvate molecules that were made in the cytosol of the cell during glycolysis. The pyruvate molecule enters the matrix of the mitochondria where it is converted to acetyl CoA. Acetyl CoA is responsible for initiating a cyclical series of reactions. 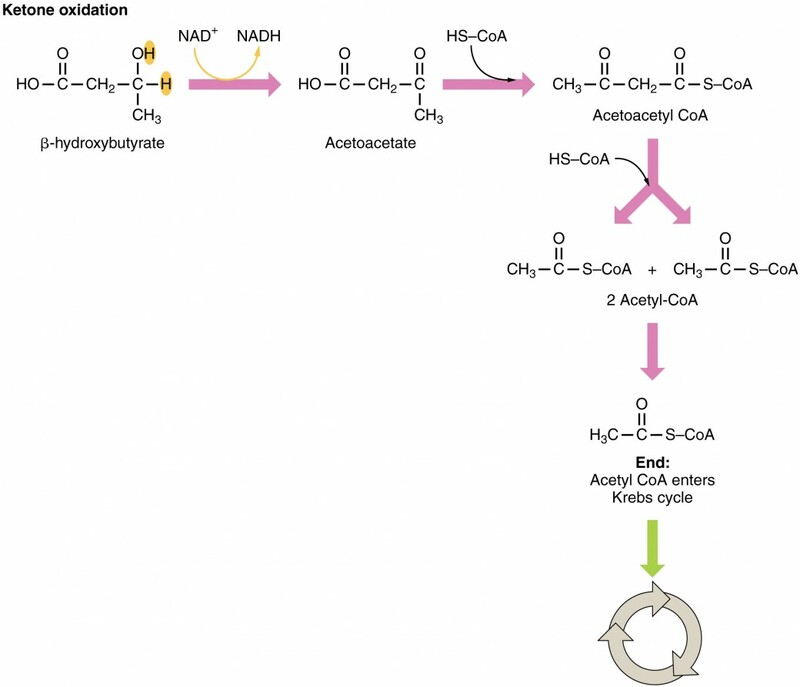 Acetyl CoA creates the first compound in the Krebs cycle (Citrate) by enzymatically transforming the very last product formed in Krebs cycle, Oxaloacetate, into Citrate. The names of these specific compounds are not important, however, it is important to understand why it is referred to as a cycle. 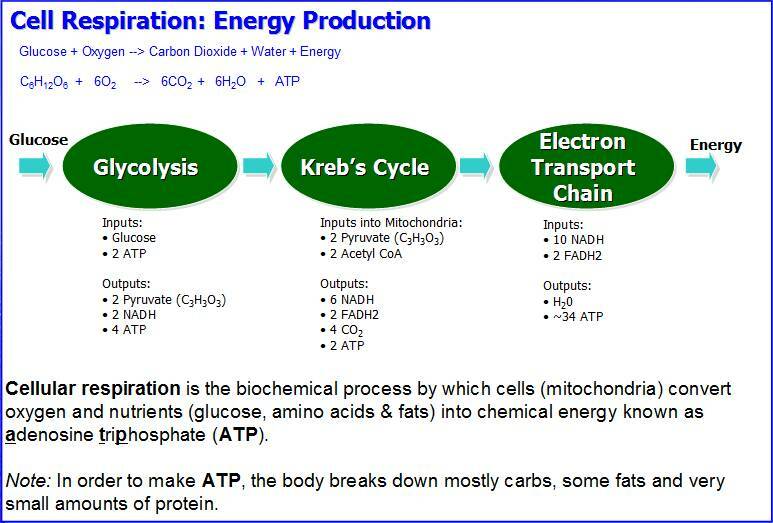 Every time through the Krebs cycle, 1 ATP molecule is created and 3 molecules of carbon dioxide, CO2, are released. Since only 1 pyruvate is needed to circle through the Krebs cycle and 2 pyruvate molecules were formed during glycolysis, the Krebs cycle is repeated. This means during cellular respiration, six carbon dioxide molecules are release and the Krebs cycle forms 2 additional ATP. Through the first two steps of cellular respiration there is a net gain of 4 ATP. 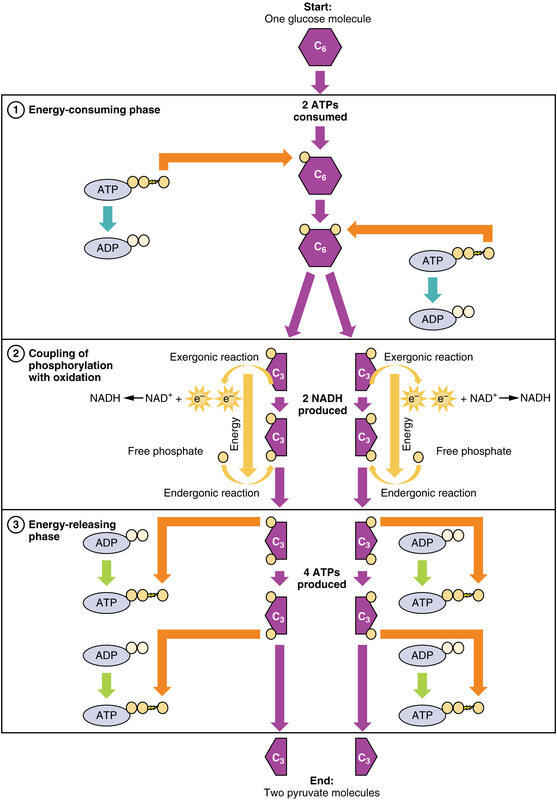 Although the Krebs cycle doesn’t provide much energy, it does yield several molecules of NADH and FADH2. These two molecules will be the key to producing many more ATPs in the third step of cellular respiration, the electron transport chain. The third and final step of cellular respiration takes place in the inner mitochondrial member and is called the electron transport chain (ETC). Remember that the mitochondria are organelles that have two phospholipid bilayer membranes. The ETC takes place within the innermost membrane. Often the term oxidative phosphorylation is used interchangeably with the electron transport chain; however, oxidative phosphorylation is the series of reaction that takes place during the ETC. You may have noticed that we are discussing aerobic respiration and haven’t yet discussed oxygen’s role, but we know that oxygen is utilized. Oxygen comes into play during this third process. This is also the step where the most energy is made. Since this third step makes the majority of ATP and it takes place within the mitochondria, we refer to the mighty mitochondria as the ‘power house of the cell’ because it supplies most of the cell’s energy. NADH and FADH2, which are made during the Krebs cycle, initiate the electron transport chain. Both NADH and FADH2 transport electrons down a chain of reactions. NADH or FADH2, whichever is present at the time, will work with electrons and oxygen to convert ADP to ATP. In the process NADH loses its hydrogen and creates a hydrogen concentration gradient across the inner mitochondria membrane. This hydrogen concentration gradient drives the production of more ATP. Since NADH lost its hydrogen, it is now NAD+. Do you remember why this is important? 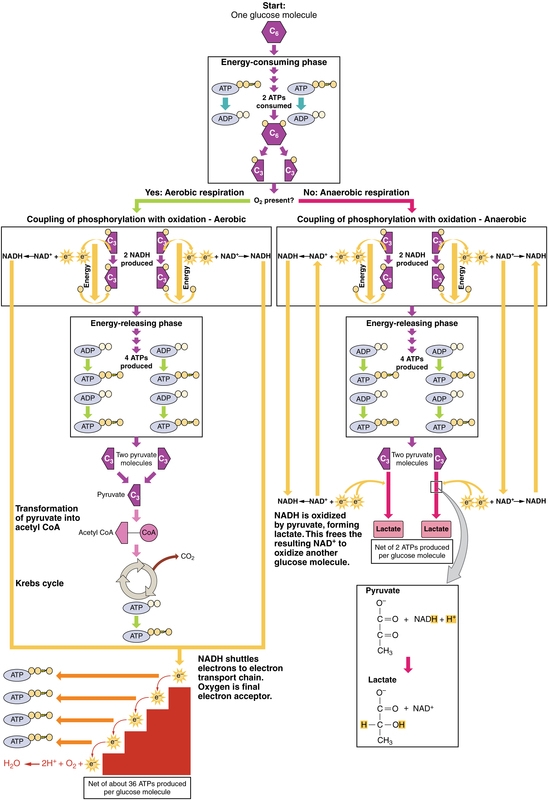 This process recycles NADH to NAD+ so that NAD+ can be reused in glycolysis. At the end of the ETC, water (H2O) and ATP is made. Depending on how many NADH molecules are available, the electron transport chain makes a total of 32 or 34 ATP. These 32-34 ATP combined with 2 ATP from glycolysis and 2 ATP from the Krebs cycle means that one molecule of glucose (sugar) can make a total of 36-38 ATP. Cellular respiration can be an anaerobic or aerobic respiration, depending on whether or not oxygen is present. Anaerobic respiration makes a total of 2 ATP. Aerobic respiration is much more efficient and can produce up to 38 ATP with a single molecule of glucose. Anaerobic respiration consists of two steps. Aerobic respiration consists of three steps. Carbohydrates are organic molecules composed of carbon, hydrogen, and oxygen atoms. The family of carbohydrates includes both simple and complex sugars. Glucose and fructose are examples of simple sugars, and starch, glycogen, and cellulose are all examples of complex sugars. The complex sugars are also called polysaccharides and are made of multiple monosaccharide molecules. Polysaccharides serve as energy storage (e.g., starch and glycogen) and as structural components (e.g., chitin in insects and cellulose in plants). During digestion, carbohydrates are broken down into simple, soluble sugars that can be transported across the intestinal wall into the circulatory system to be transported throughout the body. Carbohydrate digestion begins in the mouth with the action of salivary amylase on starches and ends with monosaccharides being absorbed across the epithelium of the small intestine. Once the absorbed monosaccharides are transported to the tissues, the process of cellular respiration begins (Figure 1). This section will focus first on glycolysis, a process where the monosaccharide glucose is oxidized, releasing the energy stored in its bonds to produce ATP. Figure 1. Cellular Respiration. Cellular respiration oxidizes glucose molecules through glycolysis, the Krebs cycle, and oxidative phosphorylation to produce ATP. Glucose is the body’s most readily available source of energy. After digestive processes break polysaccharides down into monosaccharides, including glucose, the monosaccharides are transported across the wall of the small intestine and into the circulatory system, which transports them to the liver. In the liver, hepatocytes either pass the glucose on through the circulatory system or store excess glucose as glycogen. Cells in the body take up the circulating glucose in response to insulin and, through a series of reactions called glycolysis, transfer some of the energy in glucose to ADP to form ATP (Figure 2). The last step in glycolysis produces the product pyruvate. Glycolysis begins with the phosphorylation of glucose by hexokinase to form glucose-6-phosphate. This step uses one ATP, which is the donor of the phosphate group. Under the action of phosphofructokinase, glucose-6-phosphate is converted into fructose-6-phosphate. At this point, a second ATP donates its phosphate group, forming fructose-1,6-bisphosphate. This six-carbon sugar is split to form two phosphorylated three-carbon molecules, glyceraldehyde-3-phosphate and dihydroxyacetone phosphate, which are both converted into glyceraldehyde-3-phosphate. The glyceraldehyde-3-phosphate is further phosphorylated with groups donated by dihydrogen phosphate present in the cell to form the three-carbon molecule 1,3-bisphosphoglycerate. The energy of this reaction comes from the oxidation of (removal of electrons from) glyceraldehyde-3-phosphate. In a series of reactions leading to pyruvate, the two phosphate groups are then transferred to two ADPs to form two ATPs. Thus, glycolysis uses two ATPs but generates four ATPs, yielding a net gain of two ATPs and two molecules of pyruvate. In the presence of oxygen, pyruvate continues on to the Krebs cycle (also called the citric acid cycle or tricarboxylic acid cycle (TCA), where additional energy is extracted and passed on. Figure 2. Glycolysis Overview. During the energy-consuming phase of glycolysis, two ATPs are consumed, transferring two phosphates to the glucose molecule. The glucose molecule then splits into two three-carbon compounds, each containing a phosphate. During the second phase, an additional phosphate is added to each of the three-carbon compounds. The energy for this endergonic reaction is provided by the removal (oxidation) of two electrons from each three-carbon compound. During the energy-releasing phase, the phosphates are removed from both three-carbon compounds and used to produce four ATP molecules. Watch this video to learn about glycolysis. This equation states that glucose, in combination with ATP (the energy source), NAD+ (a coenzyme that serves as an electron acceptor), and inorganic phosphate, breaks down into two pyruvate molecules, generating four ATP molecules—for a net yield of two ATP—and two energy-containing NADH coenzymes. The NADH that is produced in this process will be used later to produce ATP in the mitochondria. Importantly, by the end of this process, one glucose molecule generates two pyruvate molecules, two high-energy ATP molecules, and two electron-carrying NADH molecules. The following discussions of glycolysis include the enzymes responsible for the reactions. When glucose enters a cell, the enzyme hexokinase (or glucokinase, in the liver) rapidly adds a phosphate to convert it into glucose-6-phosphate. A kinase is a type of enzyme that adds a phosphate molecule to a substrate (in this case, glucose, but it can be true of other molecules also). This conversion step requires one ATP and essentially traps the glucose in the cell, preventing it from passing back through the plasma membrane, thus allowing glycolysis to proceed. It also functions to maintain a concentration gradient with higher glucose levels in the blood than in the tissues. By establishing this concentration gradient, the glucose in the blood will be able to flow from an area of high concentration (the blood) into an area of low concentration (the tissues) to be either used or stored. Hexokinase is found in nearly every tissue in the body. Glucokinase, on the other hand, is expressed in tissues that are active when blood glucose levels are high, such as the liver. Hexokinase has a higher affinity for glucose than glucokinase and therefore is able to convert glucose at a faster rate than glucokinase. This is important when levels of glucose are very low in the body, as it allows glucose to travel preferentially to those tissues that require it more. In the next step of the first phase of glycolysis, the enzyme glucose-6-phosphate isomerase converts glucose-6-phosphate into fructose-6-phosphate. Like glucose, fructose is also a six carbon-containing sugar. The enzyme phosphofructokinase-1 then adds one more phosphate to convert fructose-6-phosphate into fructose-1-6-bisphosphate, another six-carbon sugar, using another ATP molecule. Aldolase then breaks down this fructose-1-6-bisphosphate into two three-carbon molecules, glyceraldehyde-3-phosphate and dihydroxyacetone phosphate. The triosephosphate isomerase enzyme then converts dihydroxyacetone phosphate into a second glyceraldehyde-3-phosphate molecule. Therefore, by the end of this chemical-priming or energy-consuming phase, one glucose molecule is broken down into two glyceraldehyde-3-phosphate molecules. The second phase of glycolysis, the energy-yielding phase, creates the energy that is the product of glycolysis. Glyceraldehyde-3-phosphate dehydrogenase converts each three-carbon glyceraldehyde-3-phosphate produced during the energy-consuming phase into 1,3-bisphosphoglycerate. This reaction releases an electron that is then picked up by NAD+ to create an NADH molecule. NADH is a high-energy molecule, like ATP, but unlike ATP, it is not used as energy currency by the cell. Because there are two glyceraldehyde-3-phosphate molecules, two NADH molecules are synthesized during this step. Each 1,3-bisphosphoglycerate is subsequently dephosphorylated (i.e., a phosphate is removed) by phosphoglycerate kinase into 3-phosphoglycerate. Each phosphate released in this reaction can convert one molecule of ADP into one high-energy ATP molecule, resulting in a gain of two ATP molecules. The enzyme phosphoglycerate mutase then converts the 3-phosphoglycerate molecules into 2-phosphoglycerate. The enolase enzyme then acts upon the 2-phosphoglycerate molecules to convert them into phosphoenolpyruvate molecules. The last step of glycolysis involves the dephosphorylation of the two phosphoenolpyruvate molecules by pyruvate kinase to create two pyruvate molecules and two ATP molecules. In summary, one glucose molecule breaks down into two pyruvate molecules, and creates two net ATP molecules and two NADH molecules by glycolysis. Therefore, glycolysis generates energy for the cell and creates pyruvate molecules that can be processed further through the aerobic Krebs cycle (also called the citric acid cycle or tricarboxylic acid cycle); converted into lactic acid or alcohol (in yeast) by fermentation; or used later for the synthesis of glucose through gluconeogenesis. When oxygen is limited or absent, pyruvate enters an anaerobic pathway. In these reactions, pyruvate can be converted into lactic acid. In addition to generating an additional ATP, this pathway serves to keep the pyruvate concentration low so glycolysis continues, and it oxidizes NADH into the NAD+ needed by glycolysis. In this reaction, lactic acid replaces oxygen as the final electron acceptor. Anaerobic respiration occurs in most cells of the body when oxygen is limited or mitochondria are absent or nonfunctional. For example, because erythrocytes (red blood cells) lack mitochondria, they must produce their ATP from anaerobic respiration. This is an effective pathway of ATP production for short periods of time, ranging from seconds to a few minutes. The lactic acid produced diffuses into the plasma and is carried to the liver, where it is converted back into pyruvate or glucose via the Cori cycle. Similarly, when a person exercises, muscles use ATP faster than oxygen can be delivered to them. They depend on glycolysis and lactic acid production for rapid ATP production. In the presence of oxygen, pyruvate can enter the Krebs cycle where additional energy is extracted as electrons are transferred from the pyruvate to the receptors NAD+, GDP, and FAD, with carbon dioxide being a “waste product” (Figure 3). The NADH and FADH2 pass electrons on to the electron transport chain, which uses the transferred energy to produce ATP. As the terminal step in the electron transport chain, oxygen is the terminal electron acceptor and creates water inside the mitochondria. Figure 3. Aerobic versus Anaerobic Respiration. The process of anaerobic respiration converts glucose into two lactate molecules in the absence of oxygen or within erythrocytes that lack mitochondria. During aerobic respiration, glucose is oxidized into two pyruvate molecules. 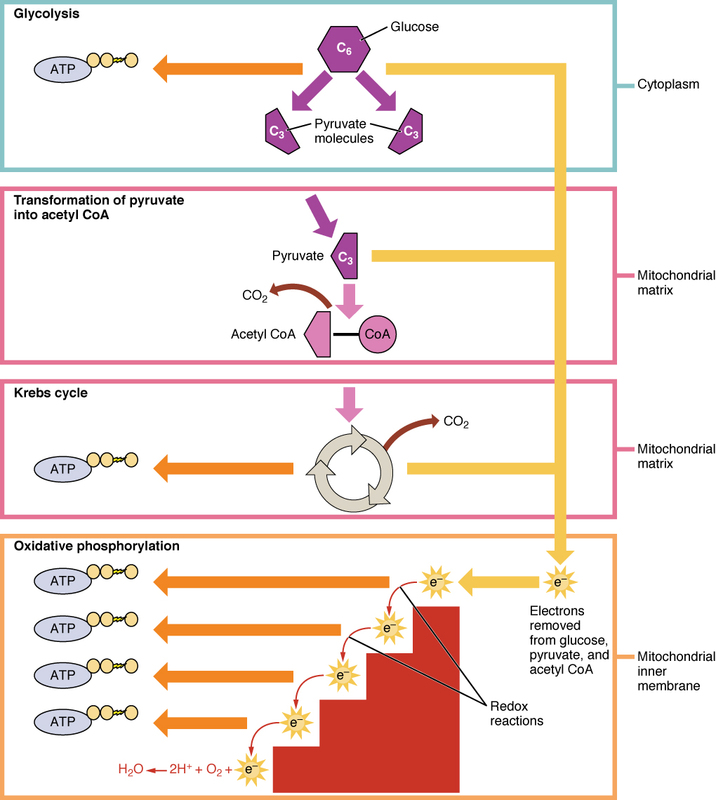 The pyruvate molecules generated during glycolysis are transported across the mitochondrial membrane into the inner mitochondrial matrix, where they are metabolized by enzymes in a pathway called the Krebs cycle (Figure 4). The Krebs cycle is also commonly called the citric acid cycle or the tricarboxylic acid (TCA) cycle. During the Krebs cycle, high-energy molecules, including ATP, NADH, and FADH2, are created. NADH and FADH2 then pass electrons through the electron transport chain in the mitochondria to generate more ATP molecules. Figure 4. Krebs Cycle. During the Krebs cycle, each pyruvate that is generated by glycolysis is converted into a two-carbon acetyl CoA molecule. The acetyl CoA is systematically processed through the cycle and produces high-energy NADH, FADH2, and ATP molecules. The three-carbon pyruvate molecule generated during glycolysis moves from the cytoplasm into the mitochondrial matrix, where it is converted by the enzyme pyruvate dehydrogenase into a two-carbon acetyl coenzyme A (acetyl CoA) molecule. This reaction is an oxidative decarboxylation reaction. It converts the three-carbon pyruvate into a two-carbon acetyl CoA molecule, releasing carbon dioxide and transferring two electrons that combine with NAD+ to form NADH. Acetyl CoA enters the Krebs cycle by combining with a four-carbon molecule, oxaloacetate, to form the six-carbon molecule citrate, or citric acid, at the same time releasing the coenzyme A molecule. The six-carbon citrate molecule is systematically converted to a five-carbon molecule and then a four-carbon molecule, ending with oxaloacetate, the beginning of the cycle. Along the way, each citrate molecule will produce one ATP, one FADH2, and three NADH. The FADH2 and NADH will enter the oxidative phosphorylation system located in the inner mitochondrial membrane. In addition, the Krebs cycle supplies the starting materials to process and break down proteins and fats. 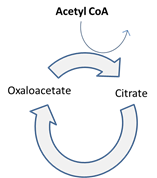 To start the Krebs cycle, citrate synthase combines acetyl CoA and oxaloacetate to form a six-carbon citrate molecule; CoA is subsequently released and can combine with another pyruvate molecule to begin the cycle again. The aconitase enzyme converts citrate into isocitrate. In two successive steps of oxidative decarboxylation, two molecules of CO2 and two NADH molecules are produced when isocitrate dehydrogenase converts isocitrate into the five-carbon α-ketoglutarate, which is then catalyzed and converted into the four-carbon succinyl CoA by α-ketoglutarate dehydrogenase. The enzyme succinyl CoA dehydrogenase then converts succinyl CoA into succinate and forms the high-energy molecule GTP, which transfers its energy to ADP to produce ATP. Succinate dehydrogenase then converts succinate into fumarate, forming a molecule of FADH2. Fumarase then converts fumarate into malate, which malate dehydrogenase then converts back into oxaloacetate while reducing NAD+ to NADH. Oxaloacetate is then ready to combine with the next acetyl CoA to start the Krebs cycle again (see Figure 4). For each turn of the cycle, three NADH, one ATP (through GTP), and one FADH2 are created. Each carbon of pyruvate is converted into CO2, which is released as a byproduct of oxidative (aerobic) respiration. The electron transport chain (ETC) uses the NADH and FADH2 produced by the Krebs cycle to generate ATP. 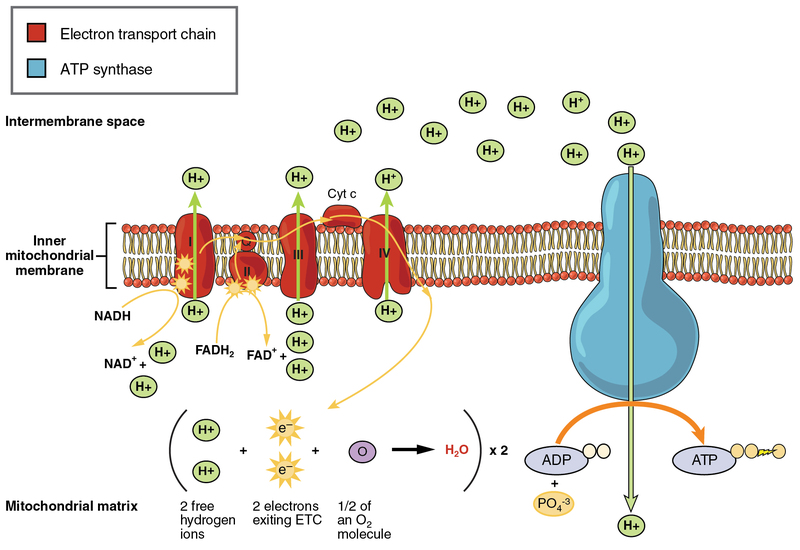 Electrons from NADH and FADH2 are transferred through protein complexes embedded in the inner mitochondrial membrane by a series of enzymatic reactions. The electron transport chain consists of a series of four enzyme complexes (Complex I – Complex IV) and two coenzymes (ubiquinone and Cytochrome c), which act as electron carriers and proton pumps used to transfer H+ ions into the space between the inner and outer mitochondrial membranes (Figure 5). The ETC couples the transfer of electrons between a donor (like NADH) and an electron acceptor (like O2) with the transfer of protons (H+ ions) across the inner mitochondrial membrane, enabling the process of oxidative phosphorylation. In the presence of oxygen, energy is passed, stepwise, through the electron carriers to collect gradually the energy needed to attach a phosphate to ADP and produce ATP. The role of molecular oxygen, O2, is as the terminal electron acceptor for the ETC. This means that once the electrons have passed through the entire ETC, they must be passed to another, separate molecule. These electrons, O2, and H+ ions from the matrix combine to form new water molecules. This is the basis for your need to breathe in oxygen. Without oxygen, electron flow through the ETC ceases. Figure 5. Electron Transport Chain. The electron transport chain is a series of electron carriers and ion pumps that are used to pump H+ ions out of the inner mitochondrial matrix. The electrons released from NADH and FADH2 are passed along the chain by each of the carriers, which are reduced when they receive the electron and oxidized when passing it on to the next carrier. Each of these reactions releases a small amount of energy, which is used to pump H+ ions across the inner membrane. The accumulation of these protons in the space between the membranes creates a proton gradient with respect to the mitochondrial matrix. A net of two ATP are produced through glycolysis (four produced and two consumed during the energy-consuming stage). However, these two ATP are used for transporting the NADH produced during glycolysis from the cytoplasm into the mitochondria. Therefore, the net production of ATP during glycolysis is zero. In all phases after glycolysis, the number of ATP, NADH, and FADH2 produced must be multiplied by two to reflect how each glucose molecule produces two pyruvate molecules. In the ETC, about three ATP are produced for every oxidized NADH. However, only about two ATP are produced for every oxidized FADH2. The electrons from FADH2produce less ATP, because they start at a lower point in the ETC (Complex II) compared to the electrons from NADH (Complex I) (see Figure 5) . Therefore, for every glucose molecule that enters aerobic respiration, a net total of 36 ATPs are produced (Figure 6). Figure 6. Carbohydrate Metabolism. Carbohydrate metabolism involves glycolysis, the Krebs cycle, and the electron transport chain. Gluconeogenesis is the synthesis of new glucose molecules from pyruvate, lactate, glycerol, or the amino acids alanine or glutamine. This process takes place primarily in the liver during periods of low glucose, that is, under conditions of fasting, starvation, and low carbohydrate diets. So, the question can be raised as to why the body would create something it has just spent a fair amount of effort to break down? Certain key organs, including the brain, can use only glucose as an energy source; therefore, it is essential that the body maintain a minimum blood glucose concentration. When the blood glucose concentration falls below that certain point, new glucose is synthesized by the liver to raise the blood concentration to normal. Gluconeogenesis is not simply the reverse of glycolysis. There are some important differences (Figure 7). Pyruvate is a common starting material for gluconeogenesis. First, the pyruvate is converted into oxaloacetate. Oxaloacetate then serves as a substrate for the enzyme phosphoenolpyruvate carboxykinase (PEPCK), which transforms oxaloacetate into phosphoenolpyruvate (PEP). From this step, gluconeogenesis is nearly the reverse of glycolysis. PEP is converted back into 2-phosphoglycerate, which is converted into 3-phosphoglycerate. Then, 3-phosphoglycerate is converted into 1,3 bisphosphoglycerate and then into glyceraldehyde-3-phosphate. Two molecules of glyceraldehyde-3-phosphate then combine to form fructose-1-6-bisphosphate, which is converted into fructose 6-phosphate and then into glucose-6-phosphate. Finally, a series of reactions generates glucose itself. In gluconeogenesis (as compared to glycolysis), the enzyme hexokinase is replaced by glucose-6-phosphatase, and the enzyme phosphofructokinase-1 is replaced by fructose-1,6-bisphosphatase. This helps the cell to regulate glycolysis and gluconeogenesis independently of each other. As will be discussed as part of lipolysis, fats can be broken down into glycerol, which can be phosphorylated to form dihydroxyacetone phosphate or DHAP. DHAP can either enter the glycolytic pathway or be used by the liver as a substrate for gluconeogenesis. Figure 8. Gluconeogenesis. Gluconeogenesis is the synthesis of glucose from pyruvate, lactate, glycerol, alanine, or glutamate. The human body’s metabolic rate decreases nearly 2 percent per decade after age 30. Changes in body composition, including reduced lean muscle mass, are mostly responsible for this decrease. The most dramatic loss of muscle mass, and consequential decline in metabolic rate, occurs between 50 and 70 years of age. Loss of muscle mass is the equivalent of reduced strength, which tends to inhibit seniors from engaging in sufficient physical activity. This results in a positive-feedback system where the reduced physical activity leads to even more muscle loss, further reducing metabolism. There are several things that can be done to help prevent general declines in metabolism and to fight back against the cyclic nature of these declines. These include eating breakfast, eating small meals frequently, consuming plenty of lean protein, drinking water to remain hydrated, exercising (including strength training), and getting enough sleep. These measures can help keep energy levels from dropping and curb the urge for increased calorie consumption from excessive snacking. While these strategies are not guaranteed to maintain metabolism, they do help prevent muscle loss and may increase energy levels. Some experts also suggest avoiding sugar, which can lead to excess fat storage. Spicy foods and green tea might also be beneficial. Because stress activates cortisol release, and cortisol slows metabolism, avoiding stress, or at least practicing relaxation techniques, can also help. Metabolic enzymes catalyze catabolic reactions that break down carbohydrates contained in food. The energy released is used to power the cells and systems that make up your body. Excess or unutilized energy is stored as fat or glycogen for later use. Carbohydrate metabolism begins in the mouth, where the enzyme salivary amylase begins to break down complex sugars into monosaccharides. These can then be transported across the intestinal membrane into the bloodstream and then to body tissues. In the cells, glucose, a six-carbon sugar, is processed through a sequence of reactions into smaller sugars, and the energy stored inside the molecule is released. The first step of carbohydrate catabolism is glycolysis, which produces pyruvate, NADH, and ATP. Under anaerobic conditions, the pyruvate can be converted into lactate to keep glycolysis working. Under aerobic conditions, pyruvate enters the Krebs cycle, also called the citric acid cycle or tricarboxylic acid cycle. In addition to ATP, the Krebs cycle produces high-energy FADH2 and NADH molecules, which provide electrons to the oxidative phosphorylation process that generates more high-energy ATP molecules. For each molecule of glucose that is processed in glycolysis, a net of 36 ATPs can be created by aerobic respiration. Under anaerobic conditions, ATP production is limited to those generated by glycolysis. While a total of four ATPs are produced by glycolysis, two are needed to begin glycolysis, so there is a net yield of two ATP molecules. In conditions of low glucose, such as fasting, starvation, or low carbohydrate diets, glucose can be synthesized from lactate, pyruvate, glycerol, alanine, or glutamate. This process, called gluconeogenesis, is almost the reverse of glycolysis and serves to create glucose molecules for glucose-dependent organs, such as the brain, when glucose levels fall below normal. Fats (or triglycerides) within the body are ingested as food or synthesized by adipocytes or hepatocytes from carbohydrate precursors. Lipid metabolism entails the oxidation of fatty acids to either generate energy or synthesize new lipids from smaller constituent molecules. Lipid metabolism is associated with carbohydrate metabolism, as products of glucose (such as acetyl CoA) can be converted into lipids. Figure 1. A triglyceride molecule (a) breaks down into a monoglyceride (b). Lipid metabolism begins in the intestine where ingested triglycerides are broken down into smaller chain fatty acids and subsequently into monoglyceride molecules by pancreatic lipases, enzymes that break down fats after they are emulsified by bile salts. When food reaches the small intestine in the form of chyme, a digestive hormone called cholecystokinin (CCK) is released by intestinal cells in the intestinal mucosa. CCK stimulates the release of pancreatic lipase from the pancreas and stimulates the contraction of the gallbladder to release stored bile salts into the intestine. CCK also travels to the brain, where it can act as a hunger suppressant. Figure 2. Chylomicrons contain triglycerides, cholesterol molecules, and other apolipoproteins (protein molecules). They function to carry these water-insoluble molecules from the intestine, through the lymphatic system, and into the bloodstream, which carries the lipids to adipose tissue for storage. Together, the pancreatic lipases and bile salts break down triglycerides into free fatty acids. These fatty acids can be transported across the intestinal membrane. However, once they cross the membrane, they are recombined to again form triglyceride molecules. 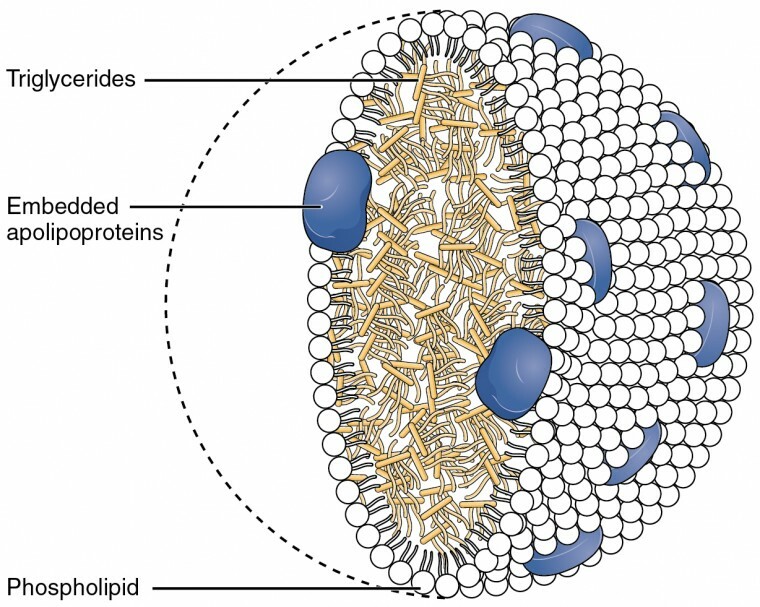 Within the intestinal cells, these triglycerides are packaged along with cholesterol molecules in phospholipid vesicles called chylomicrons. The chylomicrons enable fats and cholesterol to move within the aqueous environment of your lymphatic and circulatory systems. Chylomicrons leave the enterocytes by exocytosis and enter the lymphatic system via lacteals in the villi of the intestine. From the lymphatic system, the chylomicrons are transported to the circulatory system. Once in the circulation, they can either go to the liver or be stored in fat cells (adipocytes) that comprise adipose (fat) tissue found throughout the body. To obtain energy from fat, triglycerides must first be broken down by hydrolysis into their two principal components, fatty acids and glycerol. This process, called lipolysis, takes place in the cytoplasm. The resulting fatty acids are oxidized by β-oxidation into acetyl CoA, which is used by the Krebs cycle. The glycerol that is released from triglycerides after lipolysis directly enters the glycolysis pathway as DHAP. Because one triglyceride molecule yields three fatty acid molecules with as much as 16 or more carbons in each one, fat molecules yield more energy than carbohydrates and are an important source of energy for the human body. Triglycerides yield more than twice the energy per unit mass when compared to carbohydrates and proteins. Therefore, when glucose levels are low, triglycerides can be converted into acetyl CoA molecules and used to generate ATP through aerobic respiration. 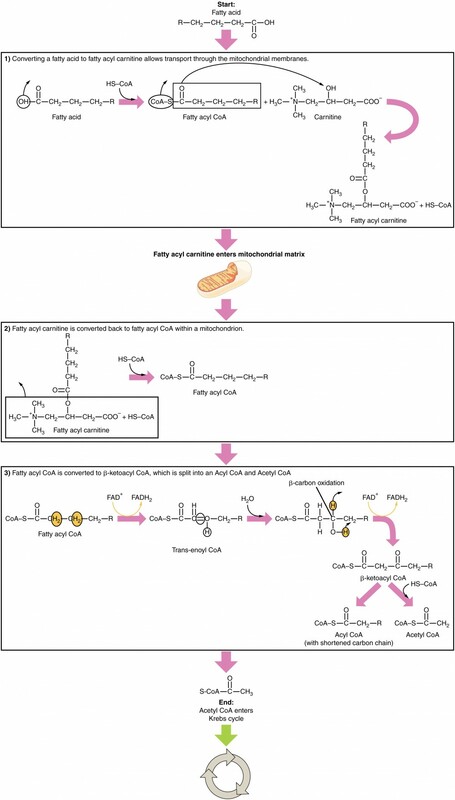 The breakdown of fatty acids, called fatty acid oxidation or beta (β)-oxidation, begins in the cytoplasm, where fatty acids are converted into fatty acyl CoA molecules. This fatty acyl CoA combines with carnitine to create a fatty acyl carnitine molecule, which helps to transport the fatty acid across the mitochondrial membrane. Once inside the mitochondrial matrix, the fatty acyl carnitine molecule is converted back into fatty acyl CoA and then into acetyl CoA. 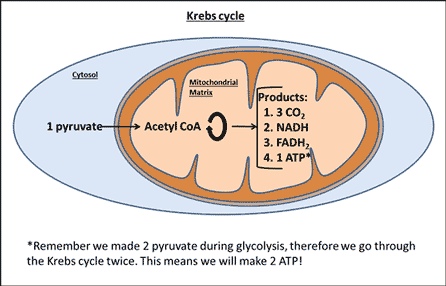 The newly formed acetyl CoA enters the Krebs cycle and is used to produce ATP in the same way as acetyl CoA derived from pyruvate. Figure 3. During fatty acid oxidation, triglycerides can be broken down into acetyl CoA molecules and used for energy when glucose levels are low. If excessive acetyl CoA is created from the oxidation of fatty acids and the Krebs cycle is overloaded and cannot handle it, the acetyl CoA is diverted to create ketone bodies. These ketone bodies can serve as a fuel source if glucose levels are too low in the body. Ketones serve as fuel in times of prolonged starvation or when patients suffer from uncontrolled diabetes and cannot utilize most of the circulating glucose. In both cases, fat stores are liberated to generate energy through the Krebs cycle and will generate ketone bodies when too much acetyl CoA accumulates. In this ketone synthesis reaction, excess acetyl CoA is converted into hydroxymethylglutaryl CoA (HMG CoA). HMG CoA is a precursor of cholesterol and is an intermediate that is subsequently converted into β-hydroxybutyrate, the primary ketone body in the blood. Figure 4. 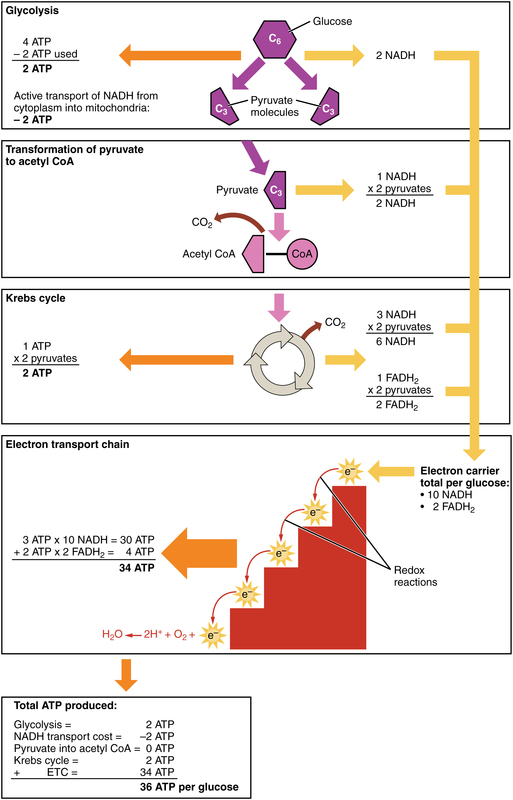 Excess acetyl CoA is diverted from the Krebs cycle to the ketogenesis pathway. This reaction occurs in the mitochondria of liver cells. The result is the production of β-hydroxybutyrate, the primary ketone body found in the blood. Organs that have classically been thought to be dependent solely on glucose, such as the brain, can actually use ketones as an alternative energy source. This keeps the brain functioning when glucose is limited. When ketones are produced faster than they can be used, they can be broken down into CO2 and acetone. The acetone is removed by exhalation. One symptom of ketogenesis is that the patient’s breath smells sweet like alcohol. This effect provides one way of telling if a diabetic is properly controlling the disease. The carbon dioxide produced can acidify the blood, leading to diabetic ketoacidosis, a dangerous condition in diabetics. Ketones oxidize to produce energy for the brain. beta (β)-hydroxybutyrate is oxidized to acetoacetate and NADH is released. An HS-CoA molecule is added to acetoacetate, forming acetoacetyl CoA. The carbon within the acetoacetyl CoA that is not bonded to the CoA then detaches, splitting the molecule in two. This carbon then attaches to another free HS-CoA, resulting in two acetyl CoA molecules. These two acetyl CoA molecules are then processed through the Krebs cycle to generate energy. Figure 5. When glucose is limited, ketone bodies can be oxidized to produce acetyl CoA to be used in the Krebs cycle to generate energy. When glucose levels are plentiful, the excess acetyl CoA generated by glycolysis can be converted into fatty acids, triglycerides, cholesterol, steroids, and bile salts. This process, called lipogenesis, creates lipids (fat) from the acetyl CoA and takes place in the cytoplasm of adipocytes (fat cells) and hepatocytes (liver cells). When you eat more glucose or carbohydrates than your body needs, your system uses acetyl CoA to turn the excess into fat. Although there are several metabolic sources of acetyl CoA, it is most commonly derived from glycolysis. Acetyl CoA availability is significant, because it initiates lipogenesis. Lipogenesis begins with acetyl CoA and advances by the subsequent addition of two carbon atoms from another acetyl CoA; this process is repeated until fatty acids are the appropriate length. Because this is a bond-creating anabolic process, ATP is consumed. However, the creation of triglycerides and lipids is an efficient way of storing the energy available in carbohydrates. Triglycerides and lipids, high-energy molecules, are stored in adipose tissue until they are needed. Although lipogenesis occurs in the cytoplasm, the necessary acetyl CoA is created in the mitochondria and cannot be transported across the mitochondrial membrane. To solve this problem, pyruvate is converted into both oxaloacetate and acetyl CoA. Two different enzymes are required for these conversions. Oxaloacetate forms via the action of pyruvate carboxylase, whereas the action of pyruvate dehydrogenase creates acetyl CoA. Oxaloacetate and acetyl CoA combine to form citrate, which can cross the mitochondrial membrane and enter the cytoplasm. In the cytoplasm, citrate is converted back into oxaloacetate and acetyl CoA. Oxaloacetate is converted into malate and then into pyruvate. 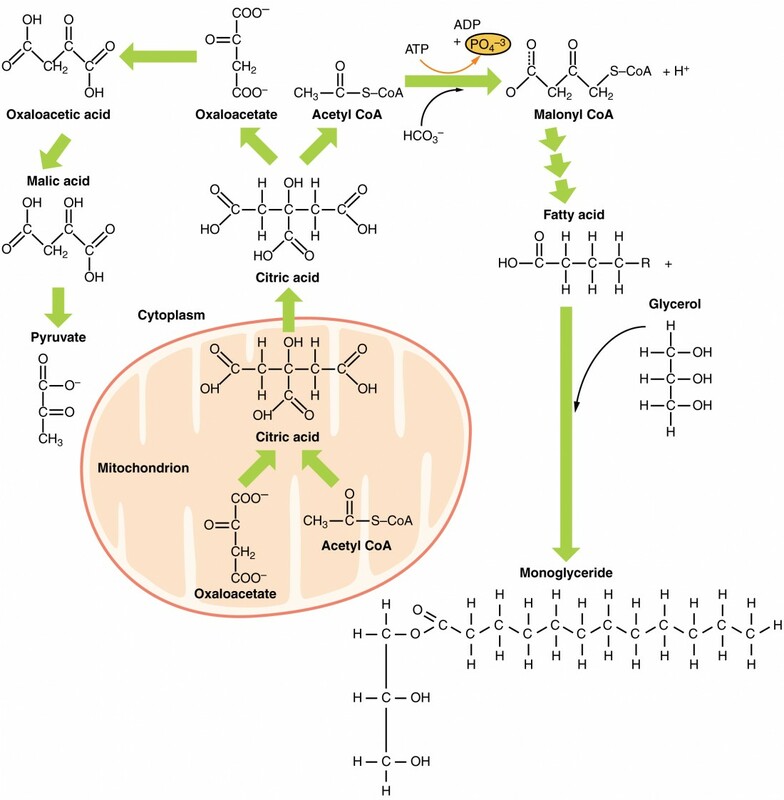 Pyruvate crosses back across the mitochondrial membrane to wait for the next cycle of lipogenesis. The acetyl CoA is converted into malonyl CoA that is used to synthesize fatty acids. 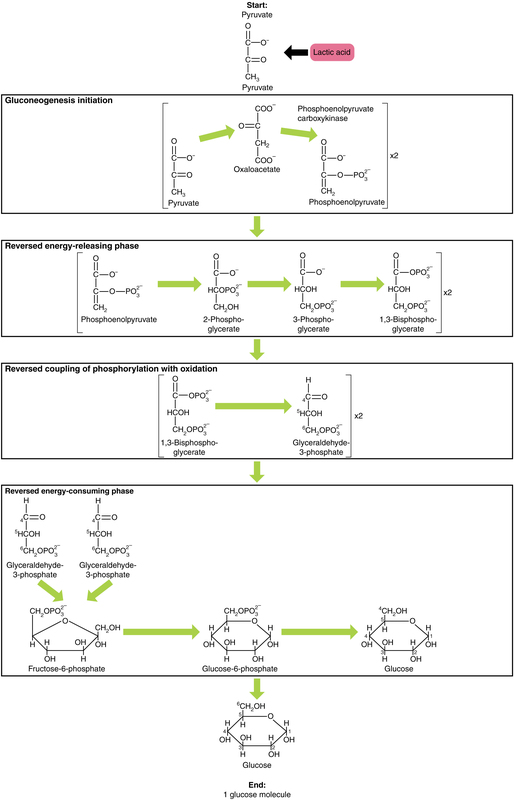 Figure 6 summarizes the pathways of lipid metabolism. Figure 6. Lipids may follow one of several pathways during metabolism. Glycerol and fatty acids follow different pathways. Lipids are available to the body from three sources. They can be ingested in the diet, stored in the adipose tissue of the body, or synthesized in the liver. Fats ingested in the diet are digested in the small intestine. The triglycerides are broken down into monoglycerides and free fatty acids, then imported across the intestinal mucosa. Once across, the triglycerides are resynthesized and transported to the liver or adipose tissue. Fatty acids are oxidized through fatty acid or β-oxidation into two-carbon acetyl CoA molecules, which can then enter the Krebs cycle to generate ATP. If excess acetyl CoA is created and overloads the capacity of the Krebs cycle, the acetyl CoA can be used to synthesize ketone bodies. When glucose is limited, ketone bodies can be oxidized and used for fuel. Excess acetyl CoA generated from excess glucose or carbohydrate ingestion can be used for fatty acid synthesis or lipogenesis. Acetyl CoA is used to create lipids, triglycerides, steroid hormones, cholesterol, and bile salts. Lipolysis is the breakdown of triglycerides into glycerol and fatty acids, making them easier for the body to process.